You just graduated from art school. Congratulations! Now what? There is a lot of ambiguous advice out there like “get your name out there” and “create a portfolio” – but how exactly do you do it? Based on my experience, here are some essential and very specific things I think you should do. 1. Create at least five new portfolio pieces. Start making new portfolio pieces right off the bat. No matter how good you think you are coming out of school, chances are you still need to go a bit further to reach pro level. New illustrators suffer from lack of experience and confidence in their art. The only way to get over it is mileage. For my own portfolio, I had replaced it with almost entirely new work within my first year after graduation. Another year after that, I had done it again. I haven’t rotated my portfolio as quickly in recent years as I’ve grown in confidence and skill, but I still consider personal projects and portfolio development one of my top priorities. As an illustrator, you will find that creating new work will always be a challenge. It is how you keep your art fresh and aim your future work in the direction you want it to go. It is especially crucial and important in the early stages of your career. Establish this habit now. 1. Buy a domain name. 3. Design and launch your site. Your website will be the cornerstone of all the marketing and networking you will do throughout the course of your career. 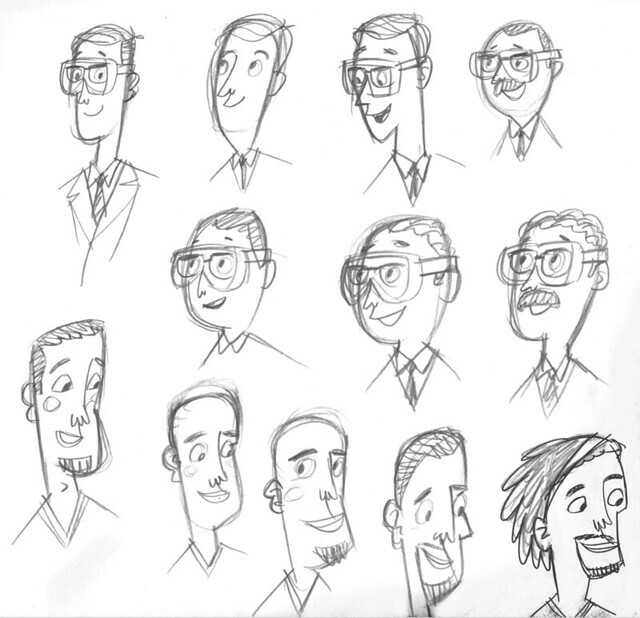 It is the first thing a lot of art directors look for when they come across a piece of art that they like. It is the home of everything you make and do. I recommend getting your own URL vs. having a blogspot/tumblr/wordpress/etc. address. You can use their services, but get your own name, at least for your main website. You are going to be using this domain throughout your career. Invest in something that is your own. Also, use your name, not some weird nickname or company name. After you buy a name, you need a host. Think of the host as like the house your website resides, whereas the domain is just the address that directs you to it. You can either buy your own hosting space and upload your own site from scratch or use something like Blogspot or Tumblr that is already pre-made, and attach your domain to it. In these instructional videos Cartoonist Peter Emslie shares how he creates characters from simple shapes. Emslie teaches character design at Sheridan College and he has illustrated over 50 books for Disney licensees. In these two lessons (which each have two videos) Emslie demonstrates how he creates characters from shapes and gradually builds them up to a rough sketch. In the first video he takes a character that he has already designed and draws him in a new pose. He starts with a line of action and then roughs in the rest of the character, working from the basic and then refining down to a finished sketch. Watch the second part to this video and the second lesson after the break. Our Spreading Your Wings posts are about looking for other places in the industry that your children’s market style can find a home. Learning to not limit ourselves to thinking that the only place our style can find us work is strictly doing children’s books. That’s simply not true. 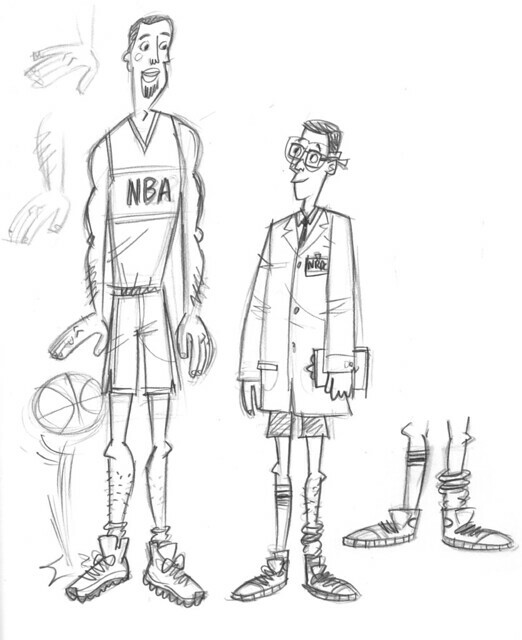 In this post award winning children’s book illustrator, Ward Jenkins drops in to shed some light adn show some sketches from his recent foray into co-directing an animated public service announcement for the NBA and NRDC about going green and recycling. Ward storyboarded the commercial, did layouts, and illustrated some key frames while another studio used Flash to animate the commercial to completion. I’ll let Ward explain it better. 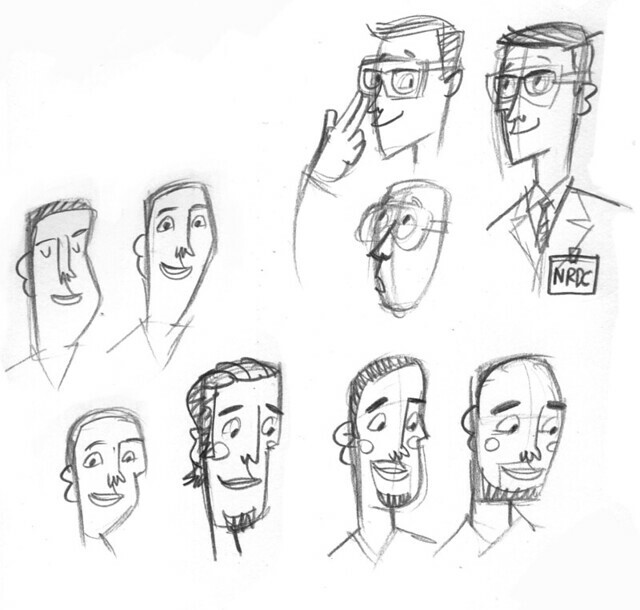 NRDC NBA Adds Up PSA – Ward Jenkins/Paul Golden from FFAKE Animation on Vimeo. It’s been a while since I’d directed anything lately, so it was a welcome pleasure for Paul Golden of Ffake to contact me about co-directing this fun public service announcement for the NBA and NRDC. That’s National Basketball Association (of course) and the National Resources Defense Council – they’re all about going green and recycling, etc. The PSA was a simple walk through of all the ways that the NBA has been working with the NRDC to make sure the league is going green – mostly through the basketball arenas and facilities. Wacom produces several lines of tablets for digital artists, graphics designers and photographers and they are adding a new entry into there line up. The Wacom Cintiq 22HD tablet Touch. Like the Cintiq 24HD Touch the new 22HD introduces multi-touch functionality for gestures like rotating canvases, panning and zooming along side the great stylus-based drawing. The stylus retains its 2048 levels of pressure sensitivity and the ExpressKeys return as well on either side of the drawing surface. The overall weight of the Cintiq 22HD has been reduced from 33.7 pounds to 18.5 pounds with the stand. With touch comes added cost. The Cintiq 22HD touch costs $2,500 which is a $500 premium on the non-touch version. Wacom is releasing a new, improved version of the Cintiq 24HD Touch in may in the US. We all can see how touch screen devices are changing the landscape for so many things, phones, games and books. Interactive experiences are the new norm for our youngsters. They no longer need to use keyboards and mouses to experience computing. So who should we look to when creating interactive experiences for our Toddlers and Preschoolers? Why Sesame Street of course. Sesame Workshop, the nonprofit educational organization behind Sesame Street, has released a PDF that offers their findings from touch screen studies and tips for designing and developing apps and ebooks for preschoolers. This document contains research commissioned by Sesame Workshop (50 studies plus) and then they break down their approach to creating educational content for touch devices. The study also categorizes the most and least intuitive gestures for touch screens, tips for visual design and layout. The PDF also outlines features for creating book apps and ebooks. Should your e-book include reading options like narration? Where are the trouble areas that kids could accidentally touch? This document addresses these questions and so many more. If you’re in the market to create an interactive experience for children this document is a good resource. You can download the PDF here. I ran across this great list of resources for those interested in learning more about e-book publishing. Jane Friedman has compiled an amazing list of resources that covers practically every aspect of e-book publishing that you can think of! Please run don’t walk over to her list and bookmark it as your go to resource for educating yourself about this aspect of our industry. Please Note: This is just a snippet and not the full article. Be sure to follow the link at the bottom of the post to see the full list of resources. About the only thing that remains constant in e-book publishing is that it changes—everything from the services to marketing strategies. Here, I’ve attempted to round-up all the good resources I know of related to (1) how to publish an e-book, (2) finding the right e-publishing services, and (3) staying on top of changes in the industry. If I’ve neglected to mention an important resource, please let me know in the comments.